Members of Congress will escape from Washington Friday afternoon for the start of their August recess, but they'll have little to brag about back in their home districts. Immigration reform has stalled. The House and Senate have yet to reconcile their respective budget bills, nor have they sent any of the 12 spending bills for the next fiscal year, which begins Oct. 1, to the president -- leaving the threat of a government shutdown looming. To cap off its unproductive summer, the Republican-led House on Friday votes for the 40th time to roll back Obamacare -- a vote destined to go nowhere. Amid all the gridlock and acrimony, lawmakers this summer will be left selling their stalled partisan agendas to their constituents and hoping that when Congress returns for nine days in September, it'll get something done. House Speaker John Boehner, R-Ohio, on Thursday insisted to reporters he wasn't worried about the perception that he's lost control of the House, or the notion that Congress will get hung up on the major challenges that await in September. "We'll take this one step at a time, and I'm sure August recess will have our members in a better mood when they come back," he said. This week, Boehner had to grapple not only with partisan divisions, but also differences within his own party. In a major blow for GOP leadership, the House on Wednesday had to pull a transportation funding bill because it did not have enough Republican votes to pass. House Appropriations Committee Chairman Hal Rogers, R-Ky., charged that the sequestration-level spending in the bill was too low -- even for Republicans. "I believe that the House has made its choice: sequestration - and its unrealistic and ill-conceived discretionary cuts - must be brought to an end," he said. 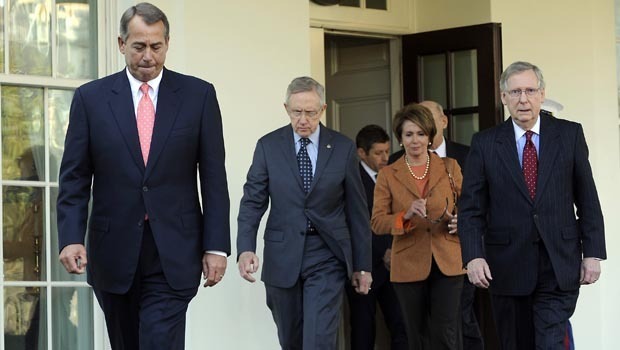 "It's clear that we're not going to have appropriations bills finished by September 30," Boehner said Thursday. "I believe that a continuing resolution for some short period of time would probably be in the nation's interest." If Congress doesn't pass a continuing resolution (a measure to extend current spending levels) by Sept. 30, some federal government operations would shut down. The divisions in the House, however, don't bode well for negotiations over the continuing resolution. Other fiscal fights are also on the horizon: Sometime this fall, Congress must raise the debt ceiling (the Treasury Department's official borrowing authority) or risk letting the nation default on its debt. And as Rogers noted, just about everyone in Washington wants to replace the steep, ongoing sequestration spending cuts with "smarter" fiscal policies -- they just can't agree on what those "smarter" policies should be. Sylvia Mathews Burwell, director of the White House's Office of Management and Budget (OMB), said at a Washington event Thursday hosted by The Wall Street Journal that the failure of the transportation bill represented an "inflection point" in the debate over sequestration and the budget. She did not, however, suggest reaching a deal with Congress would be easy. "Certainly, it is much easier to think about negotiating and having deals when there is a singular and represented point of view," she said, referring to the split GOP. White House spokesman Jay Carney on Thursday said that President Obama has been meeting with both Democrats and Republicans to discuss budget issues and will continue to do so. "The president's hope is that they will produce results and that there will be a willingness when it comes to some of these budget issues, a willingness by Republicans to offer the kind of compromise that he has offered when it comes to long-term deficit issues," he said. Mr. Obama laid out his own plan for breaking the political logjam, which consisted of corporate tax cuts in exchange for investments in job creation. Several Republicans immediately rejected the offer, but Carney said Wednesday, "I have seen Republicans express openness to the ideas." "They've asked for more specifics," he continued. "But the sort of knee-jerk reaction to anything that President Obama proposes that we saw from some quarters is not reflective of all Republicans on Capitol Hill. How could it be when they support business tax reform and they support investments in infrastructure?" The president has made the case for more investments in areas like infrastructure in a series of speeches over recent weeks, and he will deliver another speech on home ownership next week in Phoenix. On Wednesday, he huddled with congressional Democrats to sync up their August messaging: Democrats are ready to defend Obamacare, keep up the fight for comprehensive immigration reform and gun control, and -- most importantly -- push economic policies that will help the middle class. Republicans, meanwhile, have drawn up their own talking points for August, such as their goals to cut red tape and government abuse, and take down Obamacare.